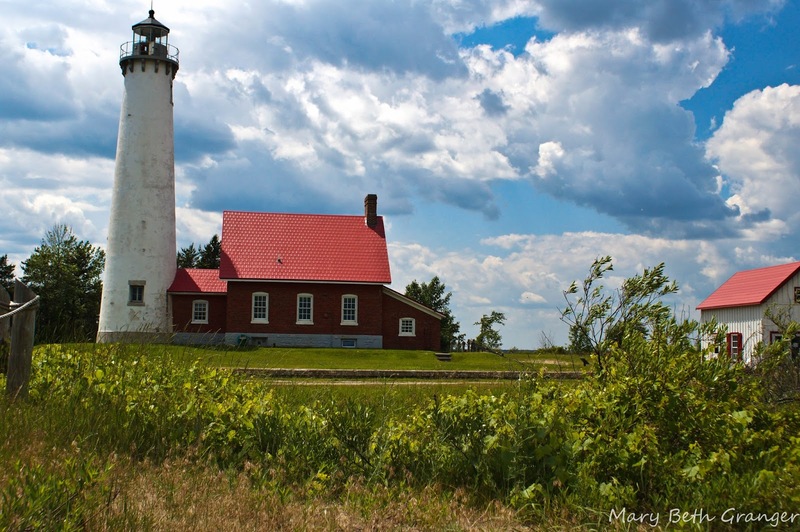 Sturgeon Point lighthouse is located on Michigan's east coast about 5 miles north of Harrisville on the banks of Lake Huron. The 70 foot tower and keepers house was built in November of 1870. 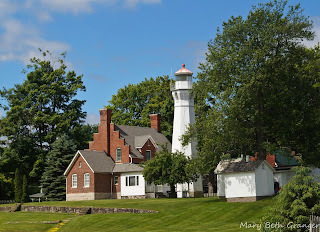 Today the keepers house is a maritime museum and the lighthouse is maintained by the US Coast Guard. The museum and tower are open to visitors during the summer months, but the grounds are open to the public year round. 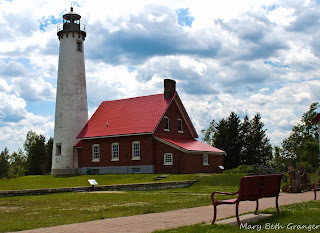 We visited this lighthouse in June of 2015. 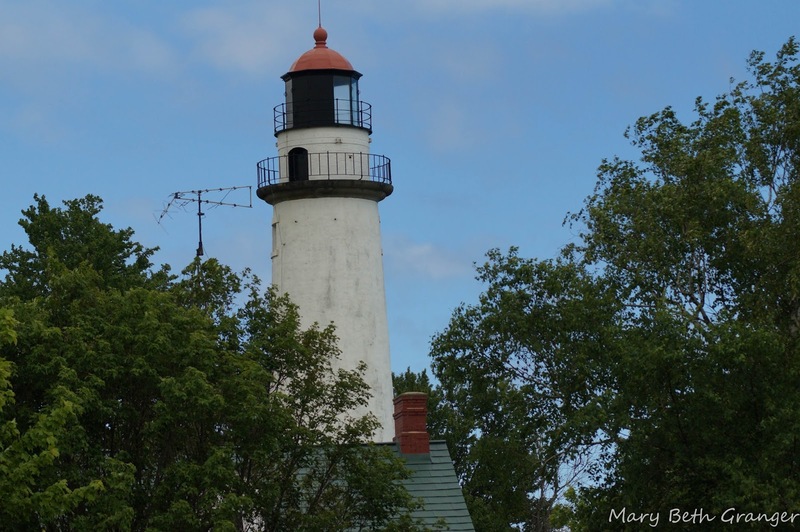 We were able to park in a lot just a short distance from the lighthouse and I wandered the grounds taking photos from various angles. 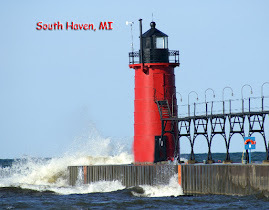 There is a rock jetty that juts out into the water in front of the lighthouse and I found it a good place to get some clear shots of the lighthouse. 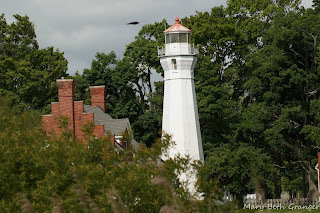 The photo above shows the lighthouse as taken from that point. The keepers house has a bright red entrance door and red window trim and shutters. They make an interesting contrast against the white tower and house. Do you have a bathroom with a lighthouse decor? This great bathmat from Zazzle will add to your theme. 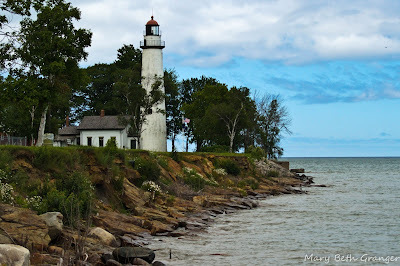 Michigan has many wonderful lighthouses to visit and photograph. This book will give you a guide to many of them. Port Sanilac was built in 1886. Today it is a private residence but the light is still active for navigation. I found it to be a bit challenging to get good photos of the lighthouse. 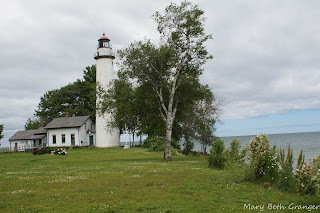 First of all it was June when we visited and the trees hid the lighthouse from the front and secondly when we got to the lighthouse the sky was very cloudy and gray looking. In the two photos below you will note the sky. I walked out on the breakwater and was able to capture these two shots without capturing too much of the sky. We decided to hang around for a while and see if the clouds would lift. After about 1/2 an hour I was able to capture some blue sky in the photo above taken from a parking lot on the side of the light. I like the wooden fence that I was able to photograph in the forefront of the photo. 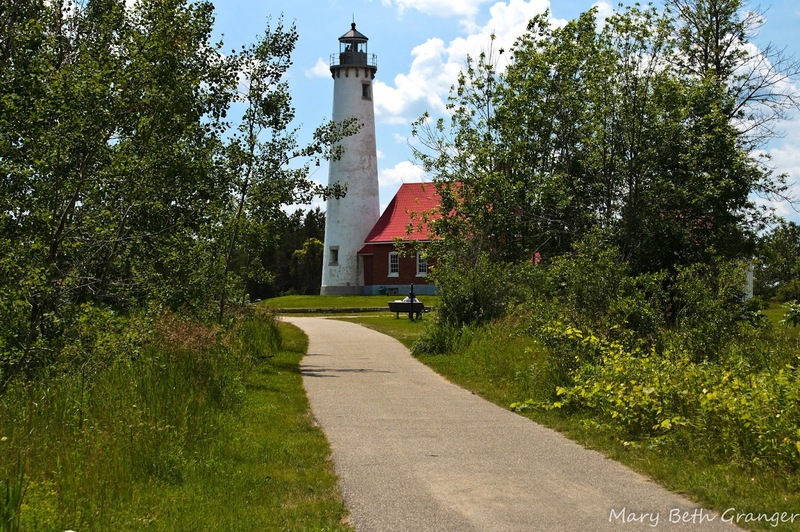 It gives a nice leading line to the lighthouse. After the breakwater photos and the wooden fence photo, we drove around the town a bit and then decided to try to photograph from the marina just below the lighthouse. 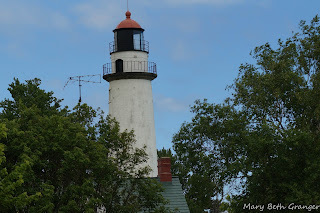 The cloud cover lifted and we were rewarded for our patience as you will see from the photos taken from the boat dock! It only took 2 hours, but I finally got a shot with blue skies. 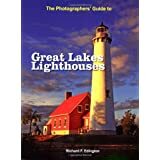 In this book the author gives great tips about places to get good photographs of lighthouses. I like how he tells if the light is best in the morning or afternoon and what places are good for sunrise/sunset photos. 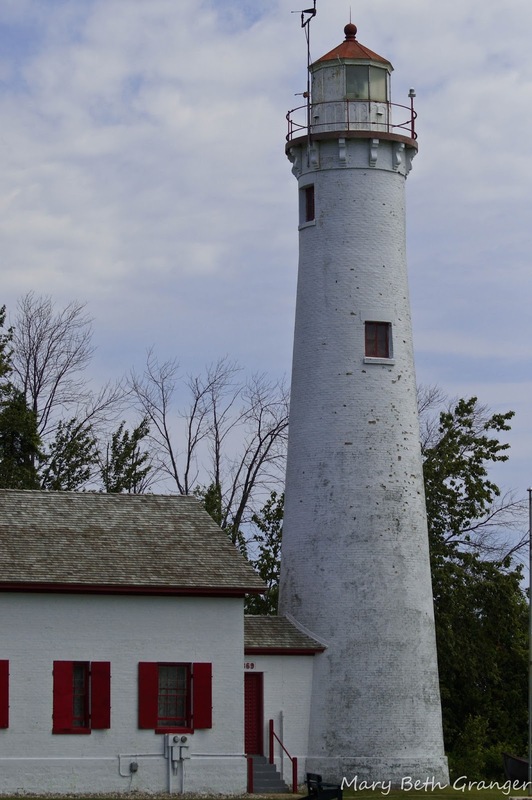 It also gives directions to each lighthouse and sample photos of the lighthouses. Point Aux Barques lighthouse is located on the shores of Lake Huron at the tip of Michigan's thumb. 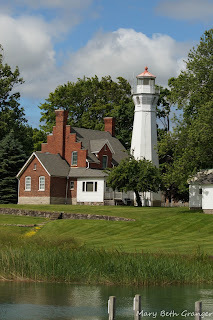 The lighthouse is one of the oldest lighthouses on the Great Lakes. 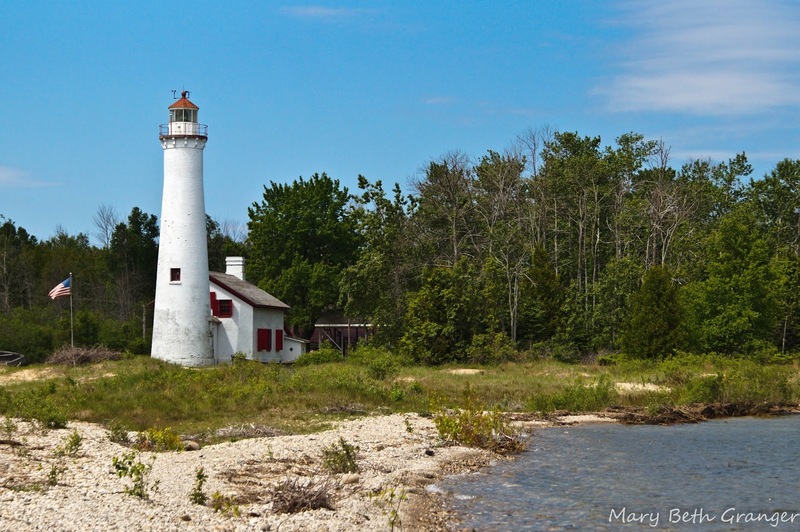 The first lighthouse on the spot was operating in 1848 but didn't last very long due to bad construction. The current tower was completed in 1857 and it is still in operation today guiding boaters and commercial traffic. The tower is 89 feet tall. 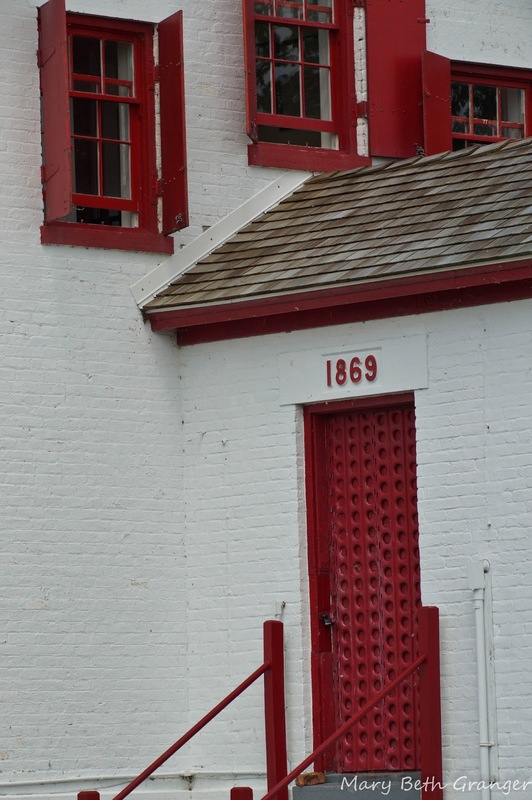 The first lighthouse keeper, Paul Shook, drowned in 1849 and his wife took over the operation of the lighthouse. She is said to be the first female lighthouse keeper on the Great Lakes. 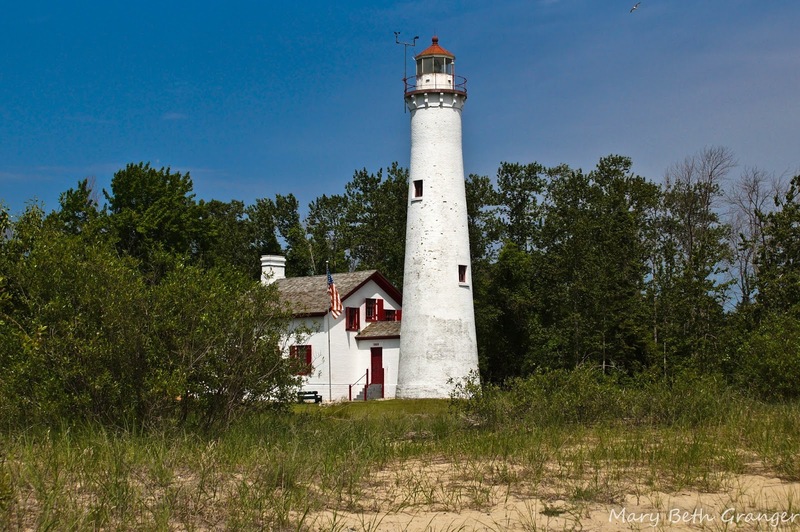 The brochure on the lighthouse states that her salary was $350 per year. Today the lighthouse grounds, a museum, and gift shop are operated by the Pointe aux Barques Lighthouse Society. 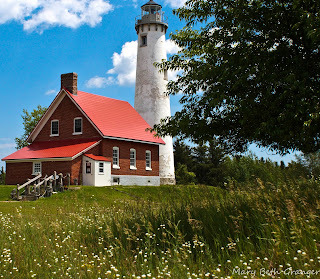 When we visited, there was no one else around so I had plenty of space to explore and photograph the lighthouse from various angles. The photo above was taken from a platform going out on the lake at the campgrounds that adjoined the lighthouse grounds. Below are several other shots I took of the lighthouse. Here is an ornament made from one of my photos of the lighthouse. 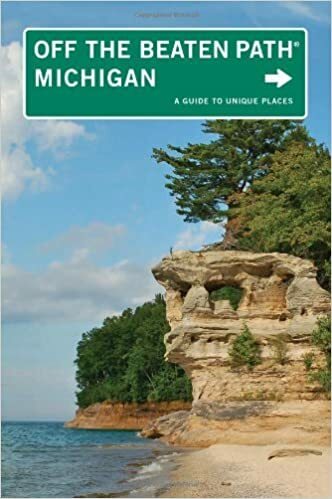 I love finding interesting place to visit in the "Off the Beaten Track" series of books. Here is one on Michigan. Tawas Point Lighthouse is located along the Michigan coast of Lake Huron.The lighthouse has been in operation since 1876. 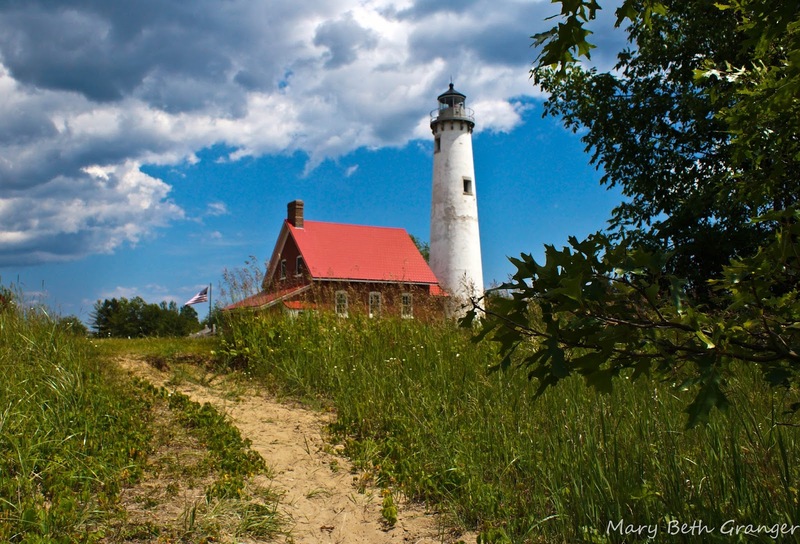 Today the lighthouse is part of Tawas Point State Park. 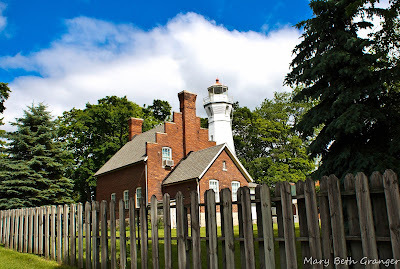 If you have ever dreamed of being a lighthouse keeper Tawas Point Lighthouse offers you an opportunity to stay in the keepers house and conduct tours of the lighthouse along with some other keepers duties. We visited Tawas Point on a beautiful June afternoon, the skies were bright blue and had some interesting cloud formations. The lighthouse grounds was not crowded so I was able to shoot several photos without people in the photos. The trees and grounds around the lighthouse made this an excellent lighthouse to photograph. 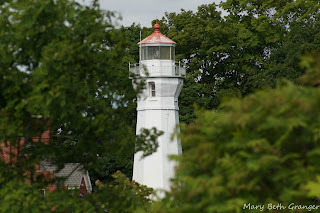 When I photograph a lighthouse I like to shoot from several different perspectives. I look for interesting objects or foliage in the foreground and leading lines such as paths or fences to draw your eye to the main subject. 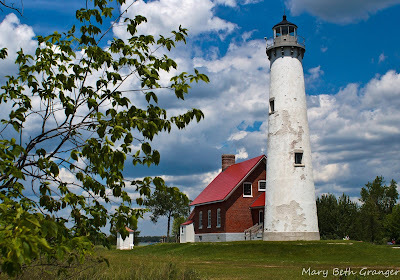 I found Tawas Point to be a great lighthouse to photograph. Below are the results of my efforts. These first two photos were taken using two of the many trail paths to lead your eye to the lighthouse. The next group of photos uses some of the trees and flowers on the property to give foreground interest and perspective. These three pictures were taken over about an hours time. You will note how the cloud formations changed the look of the photos over the time I was shooting. On days when there are moving clouds it really pays to hang around and get the changing formations in your photographs. 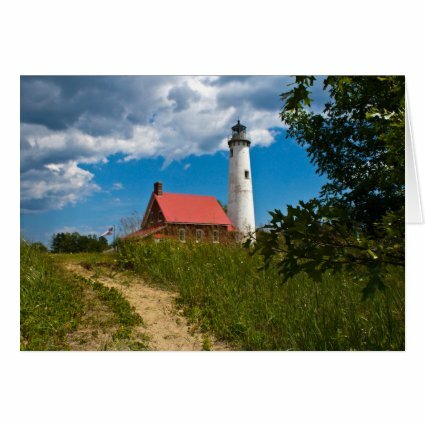 Here is a greeting card made from my lighthouse photos. 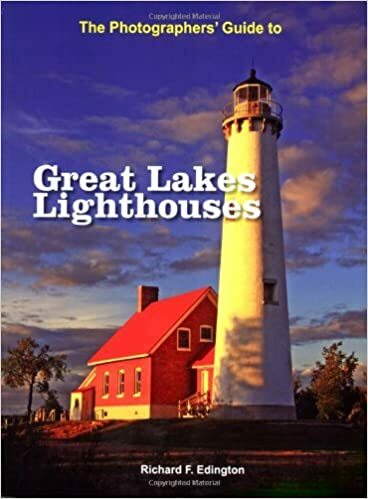 I found the ideas in this book to be very helpful in photographing Great Lakes lighthouses. 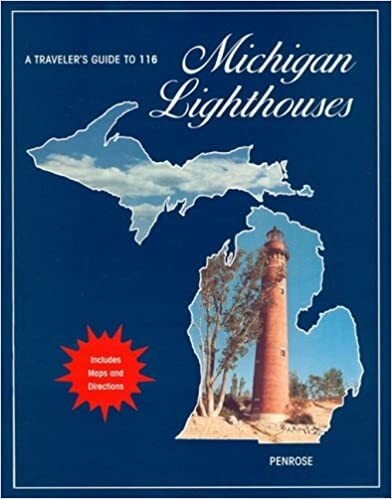 It includes directions to each lighthouse along with great photos and ideas of vantage points to take each photo.